I hope you are enjoying your weekend. If you are super busy this weekend, now is the chance for a little break - because it's time for the Pretty Paper, Pretty Ribbons Get Well Blog Hop! We have some really cute projects to share with you today, so grab something cool to drink, sit back and get comfy! Be sure to stop at each blog along the way and leave a comment because Lisa has a great gift package up for grabs for one lucky follower! 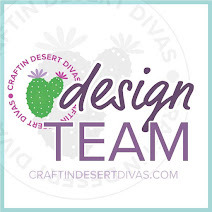 If you just left my friend Melisa's Blog over at Melisa's Crafty Creations, you are in the right place. 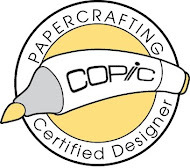 If you just stopped by my blog for a visit and would like to start at the beginning of the hop, head on over to Lisa's Blog at Pretty Paper, Pretty Ribbons. Okay - let's get started! 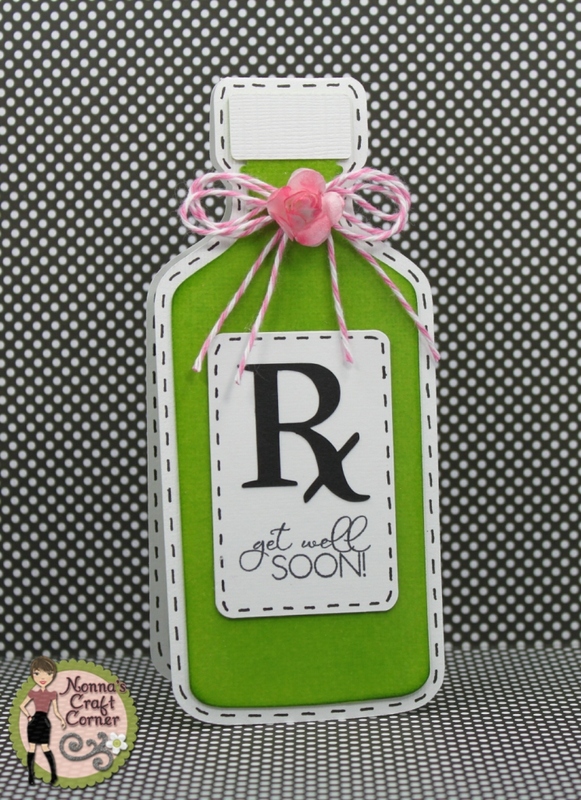 * I created a fun shape card using the medicine bottle from the Doctor Visit Cutting Files. This file has some of the cutest images! 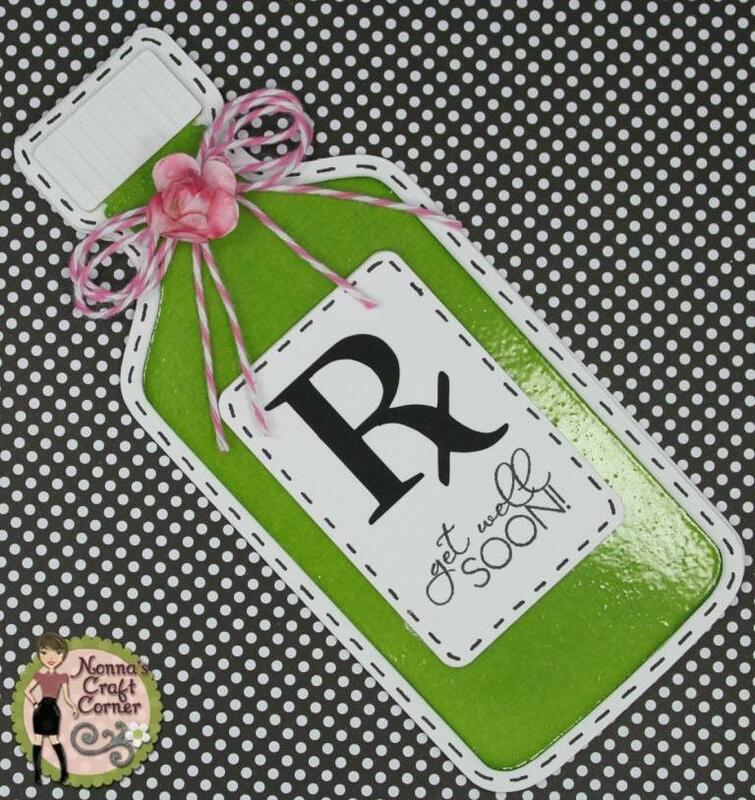 *I wanted my "medicine" to have a shine so that it would like a liquid inside the bottle. It was hard to get a good photo of the shine - but it really looks shiny in person! * I covered the green portion of my image with Vesamark Watermark Ink and then heat embossed it using clear embossing powder. * I added some stitching lines around my card with a black gel pen. * A bit of pretty twine and sweet flower finish up this fun little card. Told ya it was awesome! Notice that 15.00 Gift Certificate? YUM! 3. 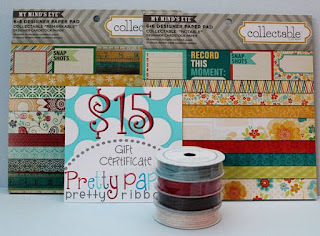 For an extra chance you can "LIKE" the Pretty Paper Pretty Ribbons FB Page and/or sign up for the Pretty Paper, Pretty Ribbons Newsletter. I know you are ready to hop on to Brianna's blog, but I have one more bit of news for you today! Lisa has decided to start offering a new CHALLENGE each month! Yay! This month's challenge will be to create a "Get Well" Project. 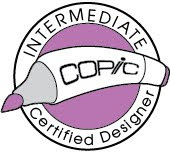 You will have until July 13th to link up, and there is a PPPR Gift Certificate to be won! You can see all the details on the PPPR Blog. I hope you will join our first ever Challenge - it's gonna be fun! Okay, it's time for me to send you on your way! Next stop is the lovely, talented Brianna of the Happy Scrapper Blog! Enjoy the rest of the hop and I'll be seeing you soon! Pink and green.....my favorite color combo....so cute, I'd even consider drinking whatever that green stuff was. ;) Adorable, Tanya. Love that it's shaped. You always make such cute stuff. I LOVE THIS CARD!!! <3 It is perfect and I love the sweet font and sentiment!! <3 Great work and great inspiration!!!! Cute and fun shaped card. Love the stitching and twine. Oh it looks shiny and I love it! New follower, although I've checked you blog out many times, I thought I was a follower. Tanya...can I just say that this medicine looks so yummy?! Love that you made it into a shaped card too! Great job!! Love the different take on the get well card-and the shiny is wonderful. This would make a great card for someone who has had oral surgery/work done as well as just someone ill. Thanks for sharing the talent, had no idea you could make the shiny using Versa Mark! Simple and sweet! I like it. Absolutely adorable!! Love the fun shape!! Awesome card!! TOTALLY Cute, COOL, & FUN!!! Very cute! Love the shine - perfect touch! What a fabulous card Tanya! I love that shiny bottle!!! I love your card Tanya. I never thought to heat emboss it to make it look shiny. What a great idea. Thanks for inspiring me. 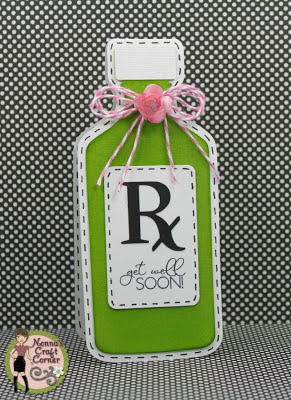 I love the medicine bottle and the heat embossing! Love your shape card Tanya! !Really great job with the shine:) Thank You for sharing. Love your fun card Tanya, the glossy effect is great!! Fun. Love the green med jar! I love that shiny medicine bottle! What a great shaped card! 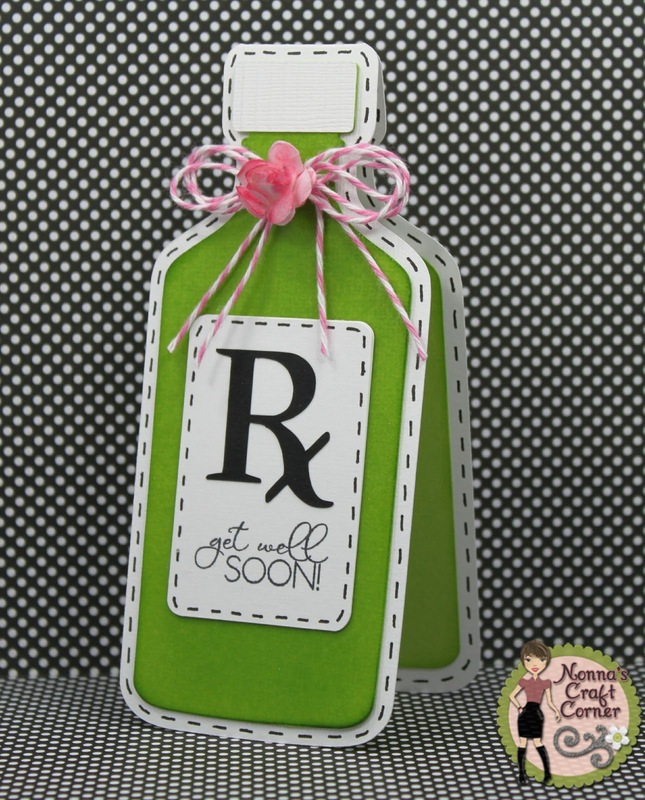 What a fun medicine bottle shaped card. Very cute! TFS. 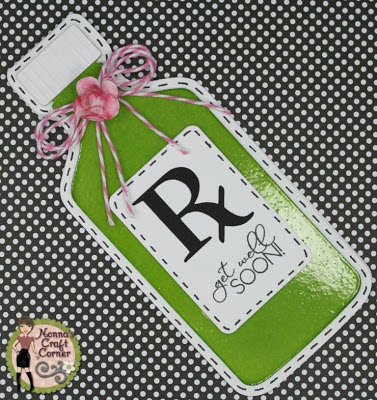 Love this RX bottle!!! Oh my how cute and to tie it off with the cute twine!!! Sweet fun card...I like the shine. The stitching and twine finish the bottle off so pretty. Wonderful job! Great card! Love the shine! This is a real tonic Tanya. Love thje glossy bottle. This is adorable, Tanya. No one would mind taking medicine if it came to them like this. Awesome get well card. I always love everything you do! I LOVE LOVE LOVE this Tanya!!! Another over the top AWESOME project!!! And the shine on the bottle....well it is perfect!!!! Thanks for sharing and enjoy your Sunday! Hope you're having a GREAT summer! (we've been gone 18 of the last 30 days-trying to escape the AZ heat-and I miss visiting you! What a great card!!! :) I love shaped cards and as always, all of your cute details (shiny bottle, stitching)! Super cute get well card Tanya! Love the shape, the sentiment and your stitching...wow, amazing! I love this card, Tanya!!!! that shine on it is PERFECT!! 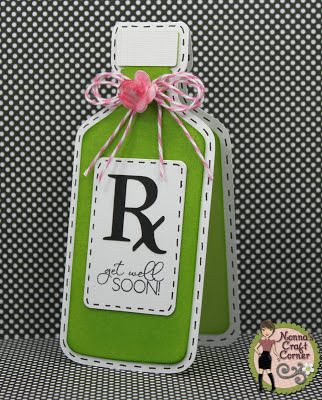 That medicine bottle is just the cutest shape for a Get Well card. Love the black marker stitching, too. Darling! omgosh!! this is sooooooo super cute! Im a follower tfs! Great shape and I like the shine, the twine and the flower. This is absolutely perfect Tanya, I LOVE it my friend!!! Fantastic card! Thanks so much for sharing!